Hurricanes are given names from lists that have been previously prepared. The names on the list are approved by the World Meteorological Organization (WMO) or by national weather offices. If a hurricane is extremely destructive, its name will be retired and never used again for a hurricane. For example, Katrina will not be used again. In the North Atlantic and northeastern Pacific, both male and female names are alternated in alphabetical order during a season. The gender of the season's first storm alternates from year to year. Six individual lists are prepared ahead of time, and one list is used for each of the next six years. In the north Atlantic, five letters are not used: Q, U,X, Y, and Z. In the northeastern Pacific, two letters are not used: Q and U. This means that there can be 21 possible hurricanes in the north Atlantic and 24 names in the northeastern Pacific before the names on the list run out. The only time a region used up its entire list was the north Atlantic in 2005. When the names are used up, additional names can be added to the list using letters from the Greek alphabet. 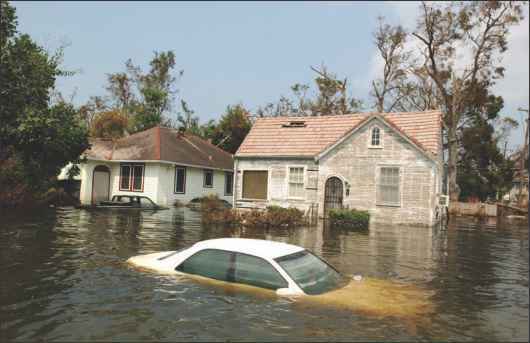 life and property damage if a hurricane comes ashore and storm surges flood coastal areas. Because of the extreme danger to life and the fact that it costs so much to clean up after the devastation of a hurricane, it is vital to take measures to avoid contributing to increases in temperature and global warming. Hurricane Andrew, for example, had 64 fatalities and cost $43.7 billion; Ivan had 124 fatalities and cost $14.2 billion; and Katrina had 1,836 fatalities and cost $125 billion. 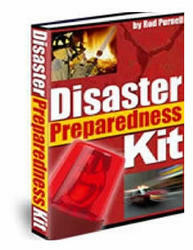 The Federal Emergency Management Agency (FEMA), part of the U.S. Department of Homeland Security (DHS), is tasked with the primary mission to reduce the loss of life and property and protect the nation from all hazards, including natural disasters. During disasters such as hurricanes, FEMA works with other organizations that are part of the nation's emergency management system, such as local emergency management agencies and the American Red Cross. They are involved in work dealing with storm surges and flooding. 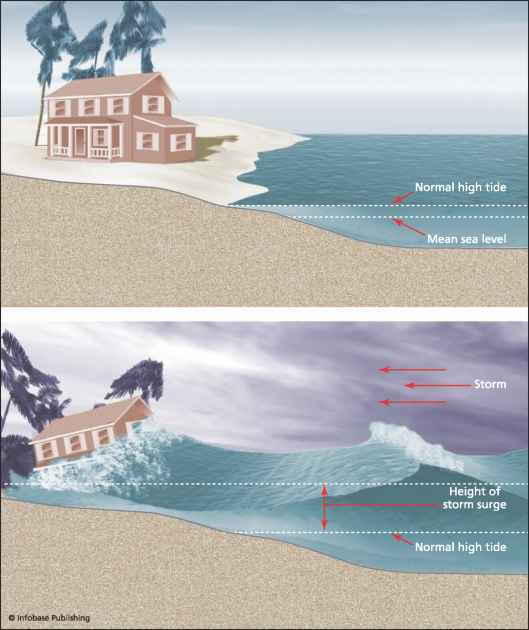 Storm surges happen over a period of time, as the ocean level continues to rise, often to the point of doing severe damage to structures in coastal areas. Computer models have been developed for coastal communities that can project various water saturation heights onto a coastal area for different hurricane categories. Computers can also simulate slow-moving and rapidly moving hurricanes in order to see the real-time potential effects of the storm. These types of computer simulations allow emergency planners to prepare evacuation and emergency preparedness plans.